When to you receive the First Time Gear Clock you actually get it as a box of bits that need to be put together to make a working clock. It is designed for those who like to build things and comes with easy to follow colour coded instructions. 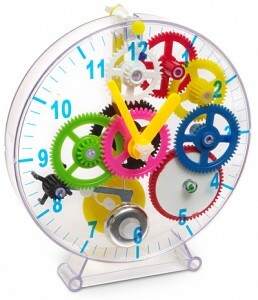 The clock is transparent allowing you to see all the inner workings and gears to see how it all works. Each part of the clock serves a purpose to teach you what it actually does and why that part is there. * Let your children learn how to make clocks, how gear wheels work and how clocks operate on the principal of a single pendulum. Available from ThinkGeek costing $14.99.